Suppose, some people searches domain by opening the URL in the address bar. Thus, if your domain Sales template installed on your domain then they can send you direct offer price and you both negotiate to common price and close the deal. So, buying Domain flipping template will helpful in growing your Domain sales business. 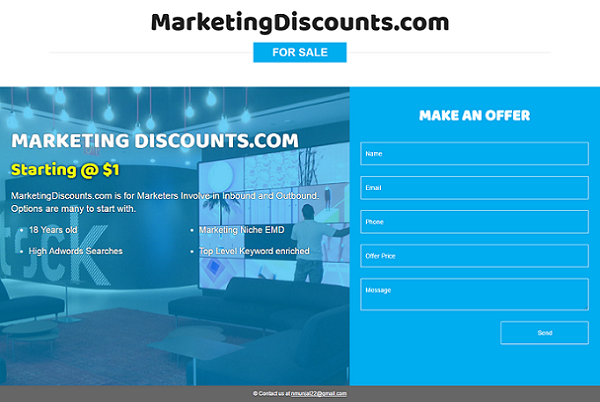 Below is the screenshot of Domain Sales template, Like I am selling MarketingDiscounts.com, I uploaded it on MarketingsDiscount.com. A domain Sales theme is a template which allows both parties to deal with Domain flipping that puts forward all conditions required under which the Seller agrees to sell and transfer to the Purchaser all the rights in and to the domain name including any and all authority and goodwill associated therewith. So if you have a business of registering domains or want to sell the domains on your own, you will need to have a website to promote your business. GoDaddy, ebay, Flippa are sites where you will be able to list your domains . Moreover, You can also opt other marketing strategies by buying whois email address and then market the domains to potential buyers. Making money online is not a easy business and not all have the skills to start a blog and make money from it. Domain flipping is the easiest way to make money online and it can make a person earn huge returns. You have to make a small investment and you will have no risks at all. Domain Flipping means to purchase an existing Domain and then sell it for a profit. The best part about Domain Flipping is that you can start earning profits right away after you purchase your first domain name (followed condition that it must be premium). You can purchase a domain for $10 dollars only and sell it for a profit of $400 if it is a great domain name. There is a huge online market for purchase and sale of domain names. Some people let their domain names expire. Sometimes people don’t need their domain any longer, some people forget to renew it, some people die, and sometimes there can be hundreds of reasons why a domain is not renewed. So, probabilities are many. This is how, you people able to Buy Premium expired domains. Domain Sales Template- Here is our designed and developed template, If you want it then you can buy it by emailing "Domain Sales template" in subject line at nmunjal22@gmail.com. So, if you are interested then buy the best domain Sales templates and enjoy gross profits by selling domains.